31-year-old Manie Blom is a man on a mission. He is a dedicated athlete and sportsman, born with loads of natural talent. He was however also born with a genetic eye-disorder, Stargardt macular dystrophy, that has been eating away his sight since the age of eight. This has left Manie with 8% vision. 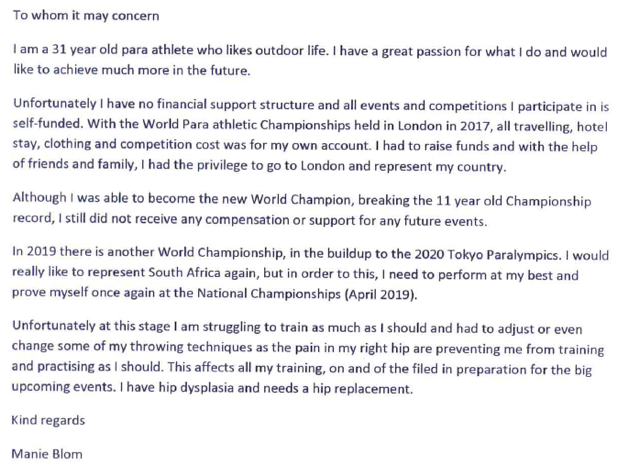 This has not caused him to lose sight of his athletics goals, in fact, it has motivated him to train harder and achieve more on the world competitive athletics stage. Initially, he competed and achieved top-honours as a 400 meters track athlete - but tragedy struck. Manie was hit by a motorbike as he and a friend were walking home. His right leg was badly broken and took four long years to fully recover. The accident also meant the end of his competitive running career. True to form, Manie adapted to his new reality - working around it - and at the age of 25 took up shot-put and discus. Despite being new to these disciplines, he not only took the national gold in both - he broke both SA records! He improved at every event and last year - at the World Para-athletics in London - took gold with a new world record distance in discus. Again, life threw Manie a curve-ball: he developed dysplasia in his right hip. The pain became unbearable and a hip-replacement was the only cure. Manie has no medical aid and has to fund all of his own athletics participation, travel and preparation - despite being the world record holder. 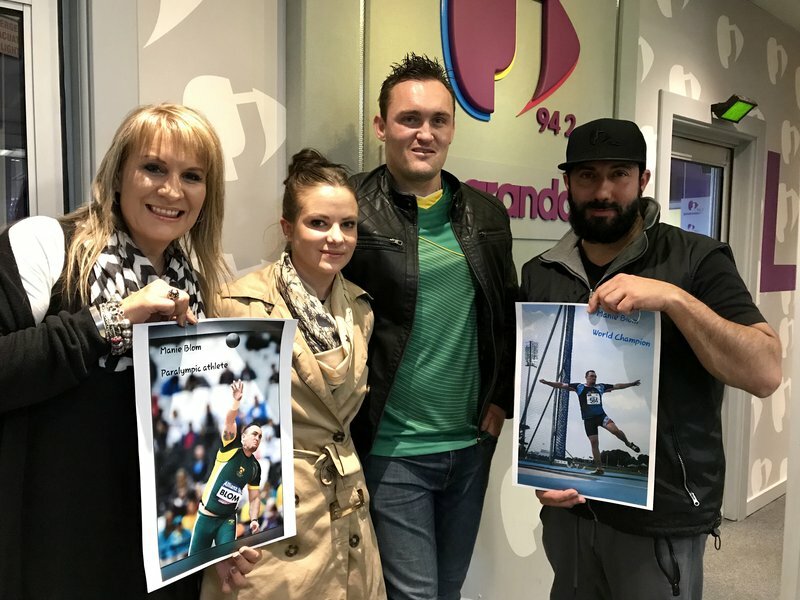 Manie reached out to Operation Healing Hands for help with his hip … he’s determined to get his preparation back on track to take Paralympic gold for Team SA in Tokyo 2020. SPONSORING: The Operation Healing Hands team at Eugene Marais Hospital did Manie’s full hip-replacement, as part of their 18 operations for Mandela Day. The entire procedure and aftercare was done free of charge. Contact Manie for sponsorship or assistance.